We have all gotten email that has been forwarded by someone else which has several names and email addresses at the top. Sometimes the list is amazingly long. The person forwarding the email did not commit the first major error, but they did exacerbate the problem and may have committed the same mistake in the process. Every one of those email addresses are now public to anyone else who gets the message in the future. This is caused by people sending an email with several names in the To: or Cc: fields. If you need to send an email to several people and keep all the email addresses confidential, you should put your own email address in the To: field and everyone else in a Bcc: field. 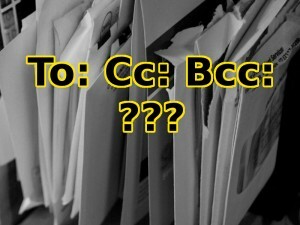 Bcc: stands for Blind Carbon Copy. 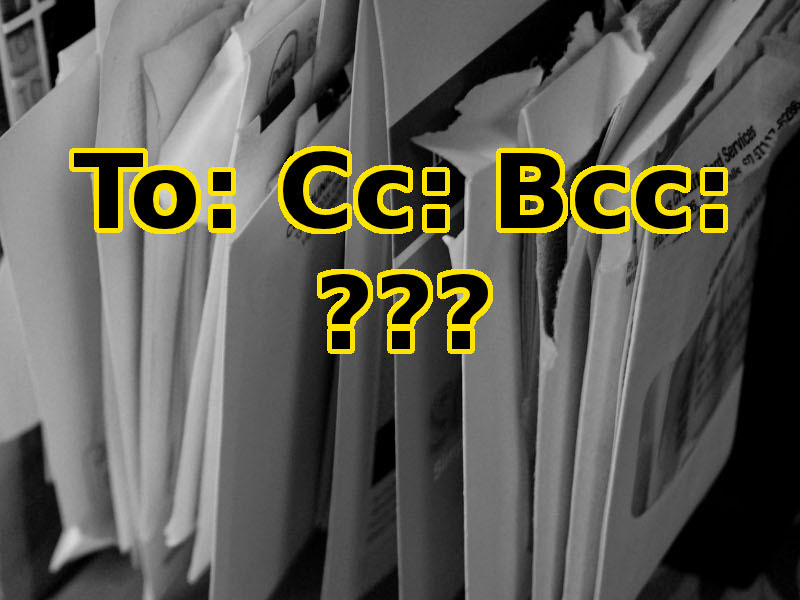 This will send the email to everyone on the list, but the people in the Bcc: address field will only see their name and yours as the recipients of the message. If they then forward the email on to all their friends, their friends will not see the addresses of all your friends you sent it to. When collaborating with a small group of people, it may be helpful to see a list of everyone who received the message. But, generally, you should not send an email to multiple people without hiding their email addresses from one another using the Bcc: field. When you need to collaborate with a group the best way to do this is to send the message To: whoever it pertains to and everyone else should be in a Cc: address field. This lets the person who is in the To: field know that the message is for them, but everyone else is being informed of the information sent. There are times when everyone in the group needs to have the same information and act upon it accordingly. For example, I am working with a group of 5 other friends right now on a project. We all include everyone else’s email addresses on every email. However, there are times when I have a question for only one person in the group. I can either send the message to her using the To: field and everyone else gets it with a Cc:, or I can just send the message to her and cut everyone else out of the conversation. If we always use the Bcc: field for our group then no one would know who else is included in the conversation. Most of the time though, you should use the Bcc: field when sending a message to multiple people, especially if they are not personal friends with one another. You should send the emails using the To: field for yourself and Bcc: for everyone else. They all get the message which appears to have originated from you and sent only to them. They do not know who else received it and you have not compromised anyone’s private email address. I am attending a conference this week in which one of the organizers sent out a mass email to all the attendees. Whether all the other people wanted this to happen or not, I now have direct access to them through their email address that the organizers unwittingly gave me. Are you sure you want every pastor on your mailing list knowing who all your other supporting pastors are? Unfortunately you can’t control how other people handle your potentially confidential email address. However, you should be careful with how you handle theirs. Why would I want to put myself in the ‘To:’ field in this case? You have to put someone in the To: field. Since everyone on the mailing list would know you and your address you can safely put your information in there. You will not be sharing information of one of the other people on your list without their permission. What if you didn’t put anyone in the TO field? Does the bcc work? I don’t think so. I think you must put someone in the TO field. But, it only takes a moment to test. I suspect your email client won’t allow that. I always put my own address into the TO field. I want to use this formatting to e-mail my softball team to update them on practices and so on. Can I send the one e-mail and keep using it, meaning when I put something in the reply section will it still go to everyone on the BCC list or it is a one time use thing and I would have to re-set up the addresses for a second e-mail? In some email clients (I only use Thunderbird and know this works here), you can set up a list of all your addresses and call it something like Ball Team. Then you can just type Ball Team in the BCC field and you are ready to go. Dig through your email’s address book features and see about setting up contact lists.